This ghostly, amorphous structure in the Chinese coastal city of Xiamen takes its inspiration from the bones and sinew of the human body. 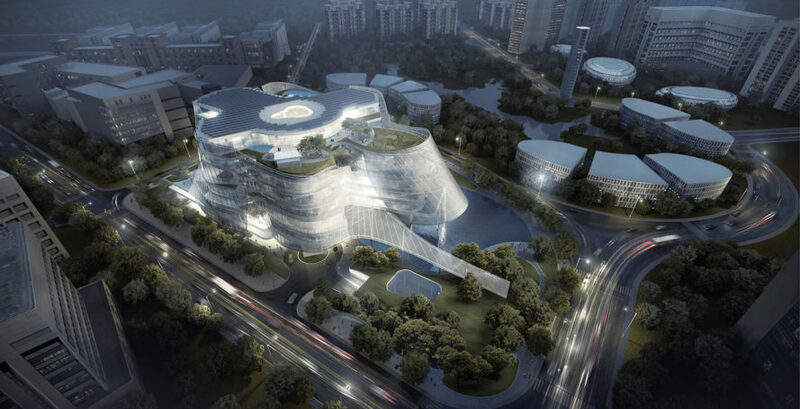 The new Xinhee Design Center, designed by MAD Architects also boasts several sustainable features, including sprawling gardens, solar panels and a sun-shading PTFE envelope, all contained in its curving, anthropoid shape. The office spaces are organized around a central atrium from which six structures extend out like arms. Each of the volumes, accommodating the offices of the group’s six subsidiary brands, has its own research and office spaces, while still allowing inter-departmental collaboration. The thin, PTFE envelope is soft and flowing, and protects the interior while appearing delicate and open. The atrium functions as a public space that visually connect the offices located on different levels of the building. This interaction extends to include the way offices spaces relate to the outside gardens. 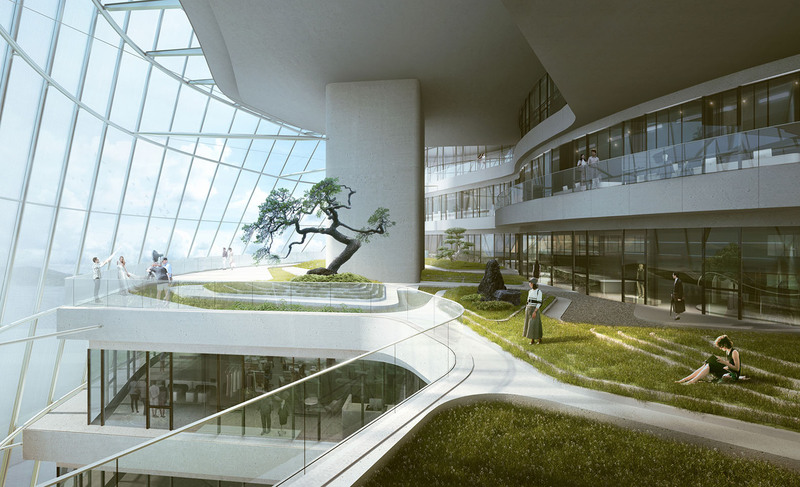 While the first floor is occupied mainly by water features and green spaces open to the public, the upper floors house office spaces with smaller green areas scattered throughout the building and the roof. These stacked gardens create a 100% green ratio, while the envelope permits 40% light transmittance. Solar panels installed on the roof of the Center will provide enough energy to meet the daily demands of the building. The office spaces are organized around a central atrium from which six structures extend out like arms. Each of the volumes, accommodating the offices of the group's six subsidiary brands, has its own research and office spaces, at the same time allowing inter-departmental collaboration. The entire project reminds of the human anatomy and the way skin attaches to bones. The thin, PTFE envelope is soft and flowing, and protects the interior while appearing delicate and free. The atrium functions as a public space that visually connect the offices located on different levels of the building. This interaction extends to include the way offices spaces relate to the outside gardens. While the first floor is occupied mainly by water features and green spaces open to the public, the upper floors house office spaces with smaller green areas scattered throughout the building and the roof. These stacked gardens create a 100% green ratio, while the envelope permits 40% light transmittance.